Green homes are designed to minimize environmental impact and maximize resource efficiency. The design, construction, and operation of a home must focus on energy, water, and resource efficiency while taking into consideration the indoor environmental quality and overall impact on the environment. 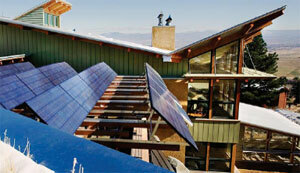 Below you will find links and definitions for common green building terms. The Dept. of Energy offers many resources and programs to assist in the area of Energy Efficiency & Renewable Energy. Heat Loss calculations are typically required for new construction. The Dept. of Energy has a program to assist called Rescheck. Using the Materials List tool in Chief Architect software, you can quickly capture the information that is needed for heat loss, such as heated glass, ceiling and floor by orientation. Simply enter information from your Materials List into the REScheck program. Increase in temperature contributed to a space by the sun’s rays. Coating applied to glass that allows light through but reflects heat, helping control seasonal interior temperature fluctuations due to solar loss and gain. Light transferring portion of a window or door. It is important to consider the thermal and light filtering properties of glazing for energy efficiency and protection of interior. The rate of heat loss is indicated in terms of the U-factor (U-value) of a window assembly. The insulating value is indicated by the R-value which is the inverse of the U-value. The lower the U-value, the greater a window’s resistance to heat flow and the better its insulating value. Often times you need a minimum U-Factor for tax and energy credits. Measurement of the thermal resistance of a material, frequently referenced as a measurement for insulation. An example of higher R-Values for residential building might be: R-50 ceilings; R-21 walls; R-30 floors. See Recommended Levels of Insulation to determine what is most cost-effective for your home. CFLs use 75% less electricity than incandescent bulbs but also contain a small amount of mercury and should be recycled. In most cases, these lights cannot be placed on a dimmer – so be aware for those applications. There is currently a wide range of building materials and techniques available to support green building. As new technologies emerge, expect to see more options becoming available. Framing techniques intended to reduce the quantity of framing materials required while at the same time increasing the insulation cavity areas and limiting thermal bridging. Learn more at the US Dept. of Energy. Stackable, permanent concrete forms that have insulation on the outer and inner sides. Concrete is pumped into the cavity to create walls that have higher insulation values than standard pour concrete walls. Technique that uses standardized components as a building practice. Modularization can occur as pre-constructed components, or as pre-defined rules for construction, such as spacing. This technique is a good method for reducing waste and making the building process more efficient, saving time and money. Products harvested and produced within a specific distance from the building site, typically 500 miles. Using local materials is an important green building practice because is supports the community economy and reduces transportation related impacts on the environment. Describes lumber that has been sustainably harvested by the Forest Stewardship Council. Composite wood products that include materials which would otherwise have been considered waste, including smaller trees. Encourages more sustainable forestry practices and protects Old Growth forests. Some engineered products are also designed to be stronger than standard lumber of equivalent size. Composite materials have the advantage of being able to leverage reclaimed or recycled products that are not able to function structurally in their current state. Examples of composites include Recycled Glass Surfaces and OSB sheathing. Considering the thermal processes of convection, conduction, absorption, and radiation in a design to maintain comfort levels and reduce or eliminate the need for mechanical systems for these purposes. Channeling the heat of the sun into natural thermal processes like radiation, conduction, and convection to heat a structure instead of relying on a mechanical heating system. A design where ventilation and the retention of cool air are optimized instead of relying on a mechanical cooling system. Using the convective nature of warm air and the ability to control windows and vents as the environment changes to control air floor in a structure. Hard surfaces that allow rainwater to infiltrate its surface and to reduce runoff, erosion and contamination of surface water. Systems implemented which capture and collect rainwater (from roof drainage for example) for use on-site. Some systems filter and purify the water, while others provide a means to distribute it, as in irrigation. Landscaping technique which employs native and drought-tolerant plants in order to reduce water needs and help preserve native species. Energy sources that are naturally replenished, examples are Solar, Wind, and Geothermal. In some cases, energy self-reliance that avoids all reliance on public utilities is referred to as "Off-the-Grid". Several tax credits are available. Uses the constant temperature of the Earth’s interior to efficiently control the heating and cooling of a structure. Mechanical system used to reclaim and recycle wasted heat from other sources in order to reduce the need for the primary energy source. Design practice that uses sunlight to reduce or removed the need for electric lighting. Elements to consider include orientation and placement of windows, light shafts/tubes, skylights, clerestory windows, reflective surfaces, and interior passage of light between rooms. Measured in units of Carbon Dioxide (CO2), a measurement of impact on the environment. Carbon Neutral is emitting no carbon dioxide into the atmosphere, or alternately adopting practices that absorb or offset the carbon dioxide that is produced. Planting trees is one way to help offset your carbon footprint. Adoption of strategies to control and reduce the amount of waste generated at a job site. Techniques include reusing and recycling, as well as careful planning to reduce excessive waste. Green products and structures feature low- or no-maintenance materials and designs that reduce the resources required for their continued use. Ease of maintenance also reduces the likelihood that replacement will be needed. Ill-health or discomfort caused by a structure’s design and/or the materials used to construct it. Factors contributing to SBS may include inadequate ventilation and chemical contaminants. Carbon compounds that vaporize at room temperature, and often contribute to poor air quality in a space. Off-Gassing is the release of volatile, toxic chemicals by products after installation. Off-gassing can be reduced by selecting no- or low-VOC products, avoiding problematic chemicals (such as formaldehyde), and controlling indoor temperature and moisture. Choosing pre-finished materials also helps to prevent the exposure of off-gassing to the design.